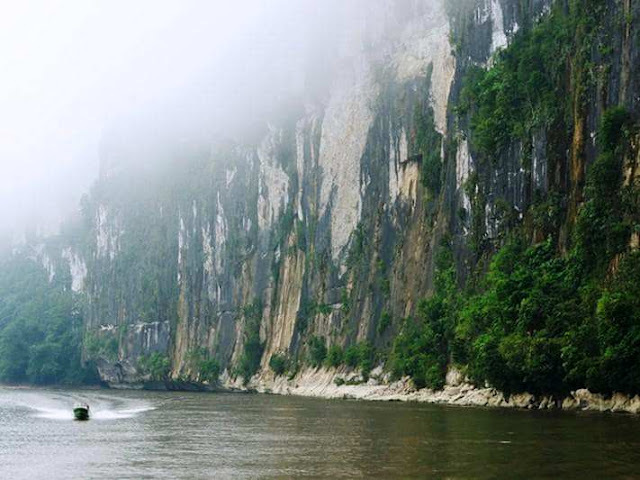 Occupying three-quarters of Borneo, the third largest island in the world, Kalimantan spells great adventures into its vast and legendary jungles, abundance of fascinating wildlife, pristine natural landscape, enchanting well preserved traditional cultures, and a whole lot more amazing experiences. Within this pristine paradise something extraordinary always lies around the next bend. From the exotic orangutan deep in the thick jungles, the mysterious Dayak villages who retain age-old traditions and way of life, to pure boating thrills along its countless rivers. Not only inland, the splendors of Kalimantan also lie beyond its seas which are filled with countless amazing creatures, perfect for those who enjoy diving, snorkeling, and underwater photography. Without a doubt, the most illustrious creature that roams the legendary jungles of Kalimantan is the Orangutan. Regarded as one of the most intelligent primates, these gentle beasts use a variety of sophisticated tools and have been extensively studied for their learning abilities. 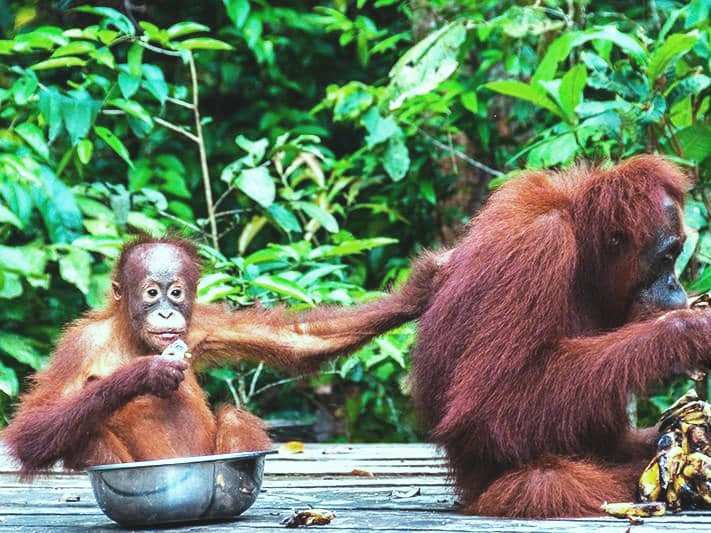 Unlike their Sumatran counterpart, Borneo’s Orangutans are relatively larger and have rounder faces, while the male adults develop wide cheek fanges as they grow older. Aside from orangutans, the thick jungles of Kalimantan are also home to many other amazing wildlife such as: the Proboscis Monkeys, Honey Bears, Long tailed Macaques, Arowana Fish, Hornbill Birds, Kancil Deer, Wild Boars, and a whole lot more. The orangutans and other amazing wildlife of Borneo can be found in numerous National Parks and Nature Reserves on the Island. In Central Kalimantan, these include: Camp Leakey and Tanjung Puting National Park, Sebangau National Park, The Lamandau River Wildlife Reserve, and Nyaru Menteng Orangutan Center. In west Kalimantan, there are: Mount Palung National Park, lake Sentarum National Park, and Betung Kerihun National Park. They can also be found at the Kutai National Park in East Kalimantan and Kayan Mentarang National Park in North Kalimantan. The indigenous people inhabiting the dense tropical rainforests of Borneo are collectively called the Dayaks, but in fact they comprise many tribes that are diverse in culture as well as in language.Although many Dayaks have modernized and converted to Christianity and Islam, however, the majority still adhere to their own ancestral belief. This is an ethnic group that has long been shrouded in myth and stories such as that they are fierce headhunters and warriors while the women are so enchanting that men are spellbound to never leave them. Apart from all myths and stories, the Dayak are a fascinating ethnic group that still retain age old traditions and ways of life wearing their colorful costumes, live in traditional longhouses, their enchanting music and dances, as well as cultural ceremonies. Moreover, you can actually unveil their shroud of mysteries and experience yourself how it is to be a Dayak by staying in some of the traditional villages such as the at the Pampang Cultural Park in East Kalimantan, the Longhouses by the Kapuas River, Loksado in South Kalimantan, and much more. 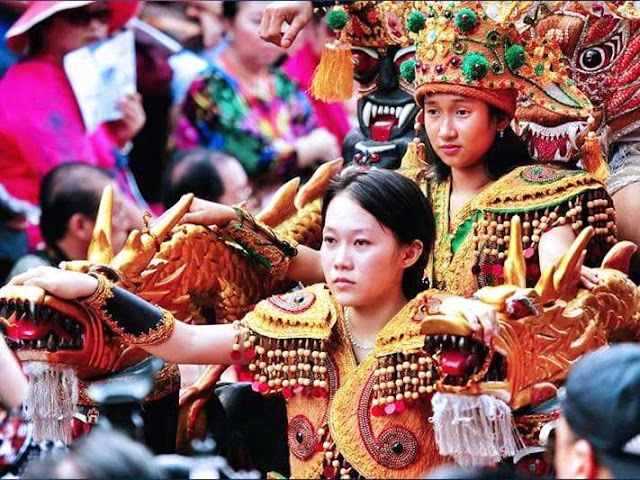 While the Dayak Culture may be the main feature of Kalimantan, one can never overlook Singkawang, an amazing little city in West Kalimantan dubbed as the City of the Thousand Chinese Temples. Unlike other towns in Indonesia, Singkawang has a distinct oriental atmosphere with hundreds of Chinese temples found around almost every corner of town. Normally a quiet city, Singkawang comes alive each Chinese New Year, reaching its climax at Cap Goh Meh, or the fifteenth day of Chinese New Year, closing the celebrations. For this event, Chinese from around the region, including those from Java and Sumatra but also from Singapore and Malaysia flock to Singkawang to celebrate the event with family and friends.During these celebrations the Tatung or Chinese shamans will perform their supernatural prowess to the thousands gathered along the streets, while remaining totally unharmed. 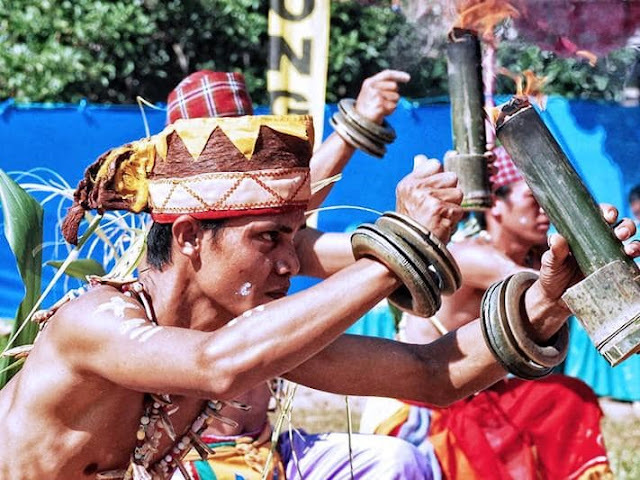 Endowed with supernatural powers, these Tatungs pierce their bodies with huge nails and other sharp metal objects and can even bend swords with their chests and stomach. With abundant wonders spread across the mainland you may think that this huge piece of land may offer only a little off its vast coastline. 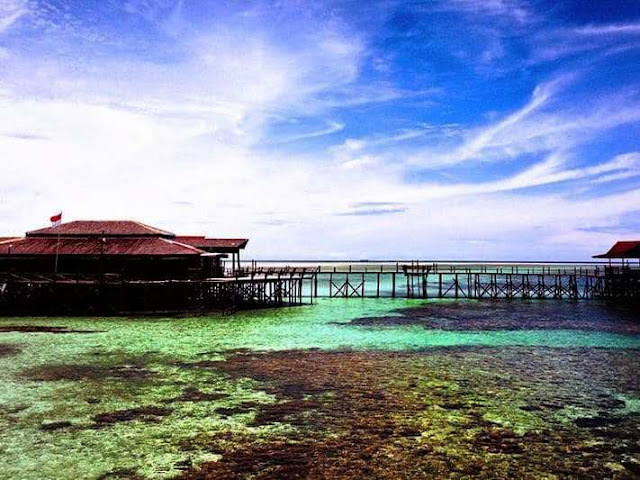 Well, guess again, for in fact Kalimantan has some of the best diving destinations in the world. Situated just off the coast of Berau Regency in East Kalimantan, the Derawan Islands are considered the third best dive destination in the world. Warm, isolated islands with soft white sandy beaches fringed with waving palm trees, pristine seas that change color from green to deep blue, and an amazing underwater life of giant turtles, dolphins, manta rays, dugongs and barracudas, stingless jellyfish and sometimes, whales, Derawan is indeed everyone’s dream of the perfect tropical paradise. Comprising a total of 31 islands, the most fascinating feature here is the atoll of Kakaban Island where you can swim with thousands of unique and truly rare stingless jellyfish. Other divers’ darling here is the waters around Sangalaki Island which is filled with some of the most fascinating sea creatures such as Manta Alfredi (PariHantu), which only exists in Derawan, Barracudas, Stingrays, giant squids and more. Meanwhile the waters around Maratua Island are the habitat of cuttlefish, lobsters, ghostpipe fish, blue-ring octopus, nudibranch, pigmy seahorses, ribbon eels, scorpion fish, and other sea dwellers.